Babita hears Laala telling Hanuman that he parked his bicycle in Minnie’s scooty’s place. She runs out of house and not finding Minnie’s scooty remembers Minnnie’s passion for her bike and taking care of it more than herself, they going on a long drive, etc. She fumes how can Minnie sell scooter without her permission. Hanuman and Laala laugh seeing her running hurriedly and leave for police station. Minnie speaks to her friend Preet and says she sold her scooty as she did not have any other to solve their financial issues for sometime. She continues explaining her ordeal. Babita walks in. Mini disconnects call. Babita says she heard everything. Minnie nervously runs in. Babita informs Nayeem Bi that Minnie sold her scooter. Nayeem bi asks why did not she ask Minnie why she sold scooty. Babita says she did not want to forgo Minnie’s sacrifice by asking it, scooty was her life. Nayeem bi says yes. Their conversation continues when they hear Laala arguing with someone, walk into balcony and see Laala scolding vendor to deliver ordered uniform on time and vendor telling his supervisor is on leave and he cannot deliver uniforms on time. Babita asks if she can take up supervisor’s job if he does not have any problem. Laala says it is an inferior job. Babita says one which can get 2 meals a day is not an inferior job. Meeta pleads Dadaji not to sign mortgage papers and says she considers him as her father and would stop even her father from signing papers. Dadaji signs papers saying he is protecting his dignity as Ashok bought this house and he can do whatever he wants, I failed to upbring Ashok properly. He returns papers and rejoins pooja. Pandit asks couples to do aarti. Dadaji asks Mita to do aarti with Ashok. Preeth’s mother records their video. In ice cream parlor Minnie and Preet enjoy ice cream discussing about their college admission when Preet sees her mother and Lovely fighting on facebook and showing Ashok and Meeta’s photo to Minnie says her family is complete now, even her dadaji accepted Meeta account. Minnie shatters hearing that and gets emotional. Precap: Venor asks Hanuman to favor him as he is giving job to babita. Hanuman scolds Babita for seeking job from vendor as he is asking favor. Minnie orders Hanuman to apologize his Babes. 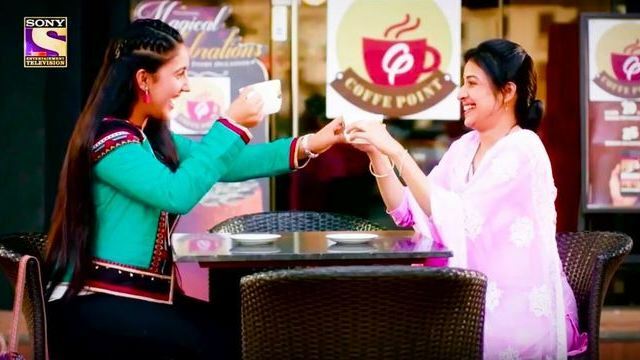 The post Patiala Babes 22nd February 2019 Written Episode Update: Dadaji Accepts Meeta As Bahu appeared first on Telly Updates.